We can understand the need to cut corners to save a dime, but automakers have a nasty habit of making their vehicles seem even cheaper than they really are. We've put together our list below of the ten worst things automakers do to cheapen their cars. Learn them now, bean counters, before your kids start ducking in the back seat when they see people they know. Vote on the worst and feel free to amend with your own pet peeves in the comments below. While there's nothing wrong with dark or color-keyed exterior cladding on rugged trucks or delivery vehicles, applying it to most cars is just wrong. 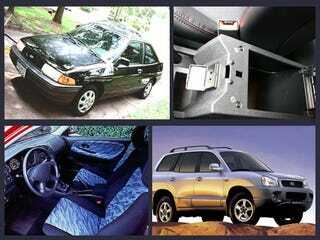 Take the Subaru Baja, for example. The caminoized Subaru wagon already had a few strikes against it in the design apartment, and the gray plastic cladding beneath brightly colored body panels made it seem more like a Fisher-Price toy car than an expensive truck alternative. It's no secret that dealers often make extra dough by charging extra money for items that should come standard, including essentials like floormats. Still, an empty footwell in a modern, carpeted car is going to lead to stains, a lower resale value and well, it just looks really cheap. What's more fun than than having a massive tire blowout on the freeway, opening up the trunk and finding a can of Fix-a-Flat? In a lightweight sports car or a vehicle with run-flat tires it's an understandable way to reduce mass, but it's completely wrong to exclude a full-size tire from the trunk of a mid-sized sedan. It's always made us think there's a conspiracy between AAA and automakers. There's advertising that promotes the relative value of a vehicle, pointing out that it offers great features at a lower price than the competition. And then there's advertising that merely points out that the car is cheap enough for even you to afford. A great example of cheap-o advertising is this Chevy Aveo billboard, which basically assumes you're so hard-up for cash you'll rip pennies off a wall. Similar to the body cladding, having dark plastic bits instead of chrome or painted accent pieces is a big way that automakers think small when creating base models. Whereas certain companies, like Honda, have moved towards making small concessions like painted door handles and painted trim, others are still replacing every conceivable shiny part with black or gray plastic. Perhaps the worst example is when they put a piece of off-color plastic in place of a fog lamp. Nothing says "I'm driving a golf kart" like tiny wheels in large wheel wells. Though we've sort of come to expect it on small cars, like the aptly named Golf, automakers have applied this concept to their cheap SUVs. Hyundai was particularly known for this, especially with their first generation Santa Fe, which left so much room between the small wheels and huge arches we imagined someone could pull the engine out through the wells. Pushing slower selling cars over to rental fleets has been a popular way for automakers to move inventory, even though the profit margins were low. This not only makes the car seem cheap (it's depressing when someone sees you in a white Taurus and asks you if your real car is in the shop), it actually makes it cheaper by lowering the resale value of the car. Recently, American automakers have limited this practice and the Koreans have gladly filled the niche. American Automakers To Continue Limiting Fleet Sales, Koreans To Take Over? A friend of ours in high school had a Mitsubishi Mirage with a seat pattern that could only be described as post-industrial Navajo. Though it's intended as a way to make cheap cars seem fun, it usually ends up making cheap cars look like the interiors were stitched out of comforters from Motel 6. The only exception is the VW GTI's historically plaid interior, though some people even have a problem with that. If Suzuki can sell a car like the SX4 with smooth, soft-touch plastics for under $15,000, then Dodge should be able to sell the $22,000 Caliber SRT4 with something better than plastics so rough and poorly-cut that the military wouldn't use them at GITMO. It's almost unconscionable in 2008 to sell a car with plastic pieces that flake, fray and and don't fit together. When exterior trim is added by the manufacturer it's specially color-matched and fitted to each car. Assuming you've already purchased the floormats, the dealer can "up sell" you even further with the addition of special exterior options clumsily installed by the dealership itself. The worst may be the taped-on stripes that end up peeling off after a few weeks in the sun or a trip through the car wash. The dealer behind the unofficial NASCAR Toyota Camry deserves a trophy, or a lawsuit, for taking this idea to its ugliest extreme. Tony Stewart Edition Toyota Camry? Sort of.